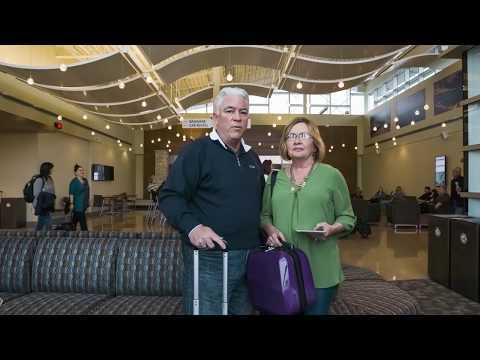 The Manhattan Regional Airport welcomes travelers with a 42,000-square-foot terminal design that celebrates the scenic Flint Hills. The terminal provides sustainable features and supports an expanded large charter and commercial air service. The new facility, which is three times the size of the previous, features regionally inspired design with the curved roofs reflecting the area’s rolling hills and locally-sourced limestone shown throughout. Inside the terminal, cloud-like, metal ceiling panels replicate the uplifting feel of the exterior roof. The extensive use of glass provides abundant natural daylighting and outward views that assist with wayfinding. The new $17 million passenger terminal consisted of nine separate projects financed with local, state and federal funding. The complex phasing included parking lot expansions and two major phases for the terminal. The first phase demolished a third of the existing terminal and built half of the new terminal. The second phase demolished the remainder of the existing terminal and completed the new terminal. All of this work was done while maintaining continuous operation throughout the project’s duration.